Let’s go for a walk. 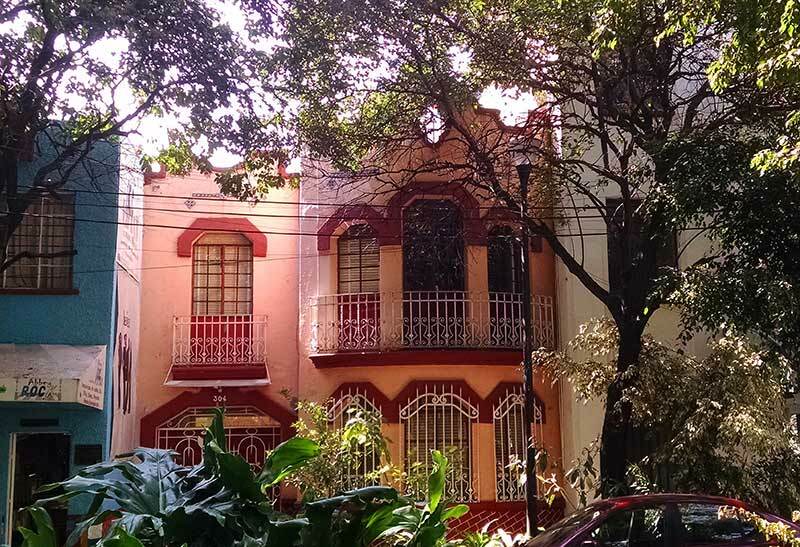 In La Condesa, the hip and trendy neighborhood in Mexico City, let’s take a slow afternoon stroll along a paved path beneath trees in full leaf, surrounded by beautiful architecture, chic cafes and unexpected corners. Let’s discover another side to this crowded, cacophonous, sometimes overwhelming megalopolis. Let’s wander along the green and leafy peacefulness of the oval called Avenida Amsterdam. If you’ve never been to Mexico City, one of the largest and most congested urban megalopolises in the world, you probably have an image of what to expect—smog, noise, crowds, crazy traffic, noise, street vendors on every corner, noise, food stalls, beggars—roiling untidy noisy life in all its messy humanness. And in much of this great city, that image would not be far off the mark. With an estimated 25 million people in the greater metropolitan area—no one really knows for sure—the cacophony and assault on the senses is undeniable. But Mexico City is far more than just that. It is also a city of world-class museums, amazing churches and other historical monuments, great centers of music and art, universities, parks, architecture to turn your head, friendly people, stellar food. And many pockets of green and peace and simple urban joy. 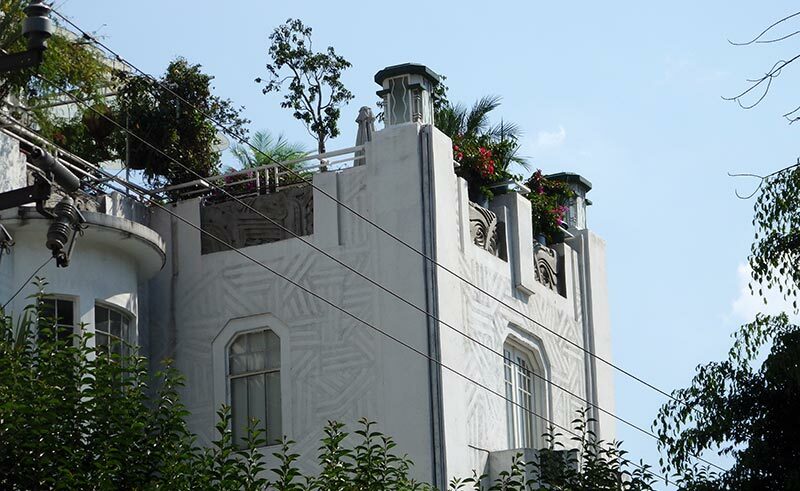 in the Condesa neighborhood of Mexico City. One of my favorites of these peaceful, leafy spaces is in the heart of the chic, young artsy neighborhood of Condesa, sometimes called the SoHo of Mexico City. Let’s take a walk together and discover why I fell in love with Avenida Amsterdam on my recent trip to this not-to-be-missed city. In the core of Barrio La Condesa in the very early 20th century, there used to be a popular horse racing track, called the Hipódromo. Its shape, the classic oval, still defines the area where horses once pounded the turf. When the racetrack moved out, green and people moved in. The center of the oval became the popular Parque Mexico, surrounded by Avenida Mexico. And around that, presumably where ladies in hats and men with cigars and fists full of pesos for betting used to sit and watch the racing thoroughbreds, runs Avenida Amsterdam. It’s here we will travel today, at a much more leisurely pace than the horses did. We will stroll, stop for photos and gazing and breathing in the peace and perhaps a coffee or a chocolate treat. Since the street still runs in an oval, just as it did in its racetrack days, it’s pretty much impossible to get lost. So we can just start walking it anywhere and keep going. We’ll eventually end up back where we started. 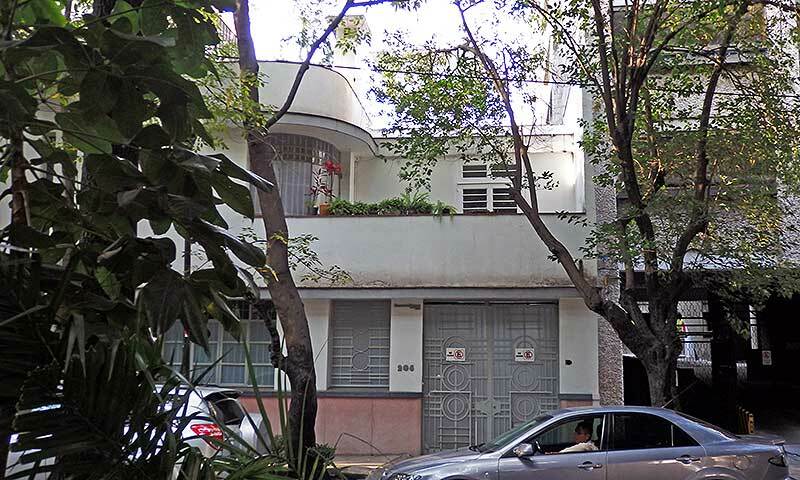 Condesa has been a trendy part of the city since the early 20th century, when wealthy people began moving out of the Centro looking for more space and more green. Many of the buildings that line Avenida Amsterdam were built after the 1920s. The area is rich in Art Deco and Streamline Moderne style with some newer higher-rise apartment buildings. That makes it a great street for one of my favorite city activities—façade gazing. 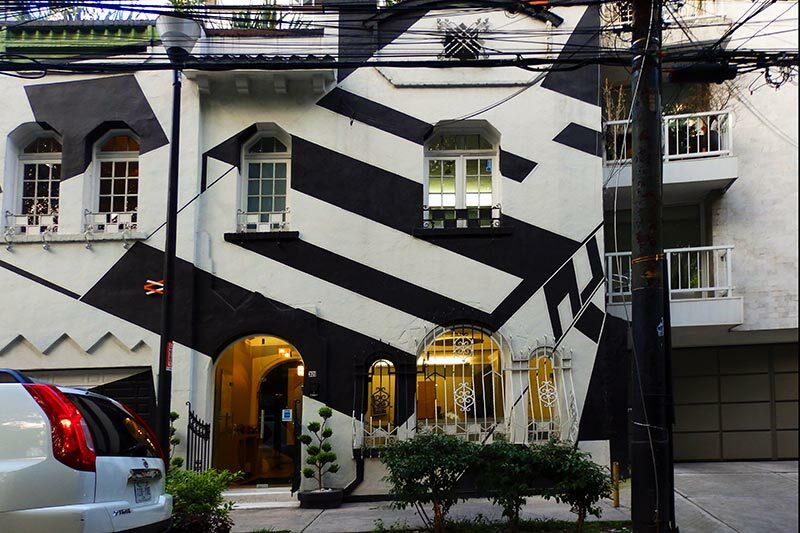 This house with its geometric paint job really stands out. A more traditionally Mexican-looking home but with some early 20th-century influences visible. To say the Avenida Amsterdam is quiet is perhaps an overstatement. Mexicans, at least in the city, don’t really do quiet. I sometimes think they are actually uncomfortable when things get a little too quiet. But by Mexican standards, it’s peaceful and inviting. It’s a broad two-way street with a wide central pedestrian meridian called a camellón. This paved path is lined with plant beds and trees, benches, the odd sculpture here and there. It’s popular with doe-eyed young couples, new mothers with strollers, dogs walking their owners. The benches attract sitters, people watchers, readers and cell phone gazers. Work-out stations invite fitness mavens to come under the trees. And there are always runners. 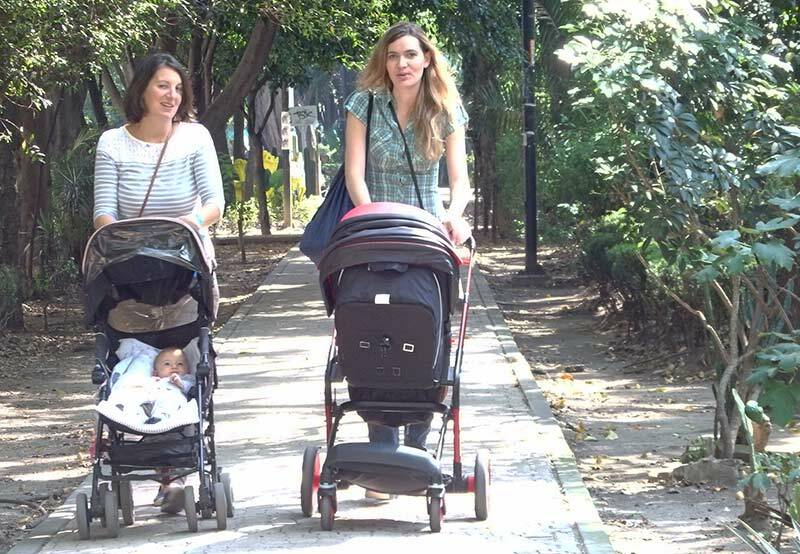 The “camellón” in the center of Avenida Amsterdam serves many purposes, including strolling with the baby. The young man on the left had just run past me a moment before, then returned on his hands, with a friend spotting him from behind. The young man on the right was taking advantage of a convenient work-out station. Even on a hot day, it’s cool and pleasant in the shade of the elms and alders, oaks, palms and rubber trees. And jacarandas. I was there in early autumn, but I must go back in spring when all those jacaranda trees will create purple clouds of blossoms drifting above the camellón. Yes, I must do that; I must see that. 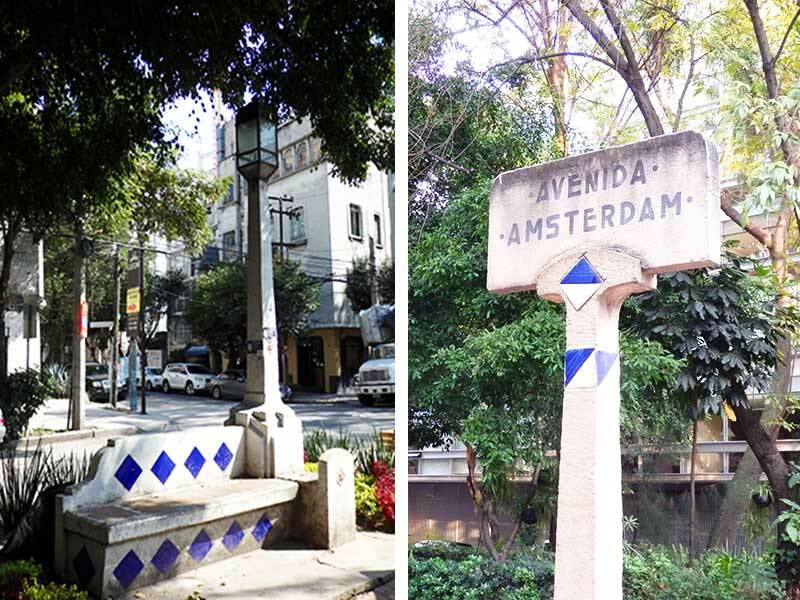 The original concrete street signs, benches and lampposts on Avenida Amsterdam in Mexico City’s La Condesa neighborhood date to the 1920s. The neighborhood is mostly still residential, but we do pass several chic shops, small businesses like the tailor and the dry cleaner, the electrical repair shop and the flower stall. And the cafes, bars, and restaurants. Because Avenida Amsterdam—indeed, much of Condesa—is café society central. We definitely won’t go hungry or thirsty on the oval Avenida. 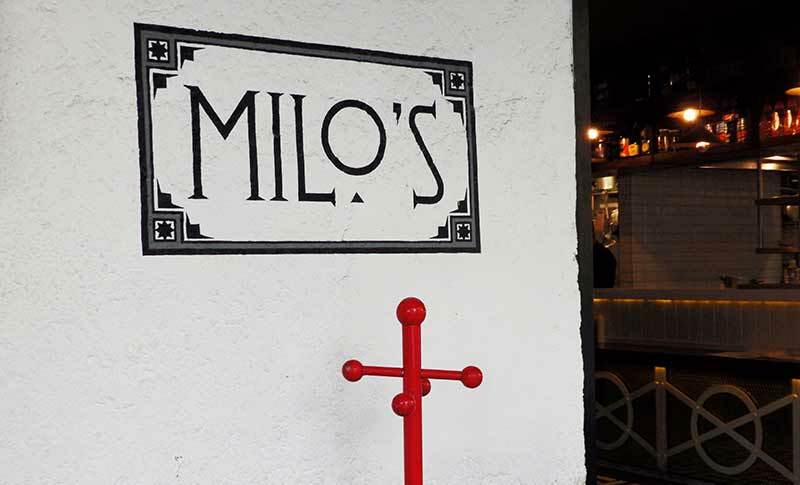 We might stop for a coffee at Milo’s, a chic, deco-style spot suggested by the host of my AirBnb home. A friend and I went there for a snack one afternoon and it was exactly what we needed, perfect in every way. 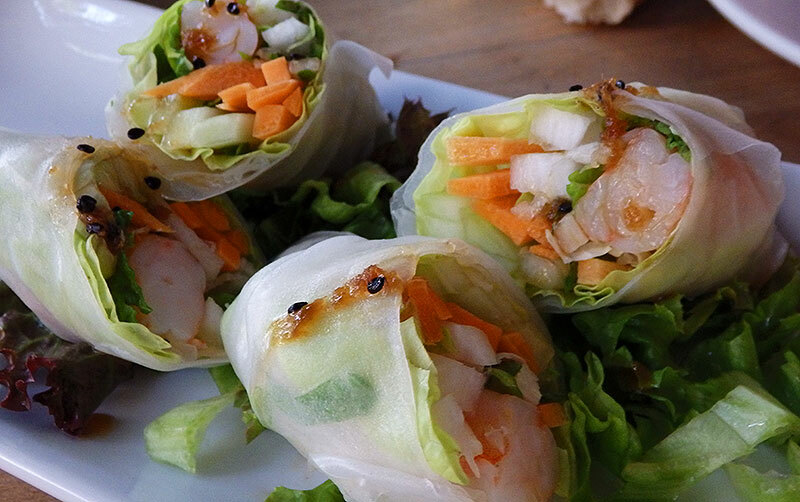 We shared a plate of Vietnamese rolls and each had a glass of delicious white wine seated at one of the sidewalk tables. 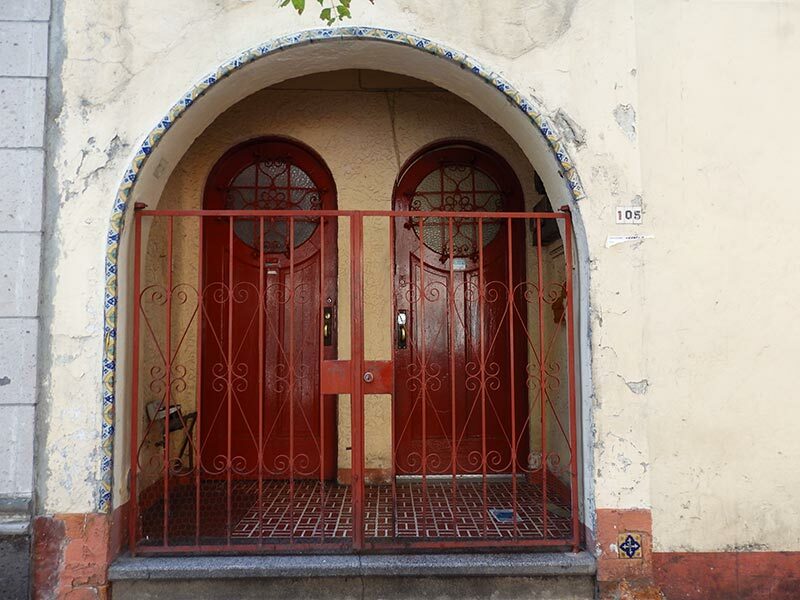 Is it just me, or do these doors on Avenida Amsterdam look just a bit “hobbit-y”?? 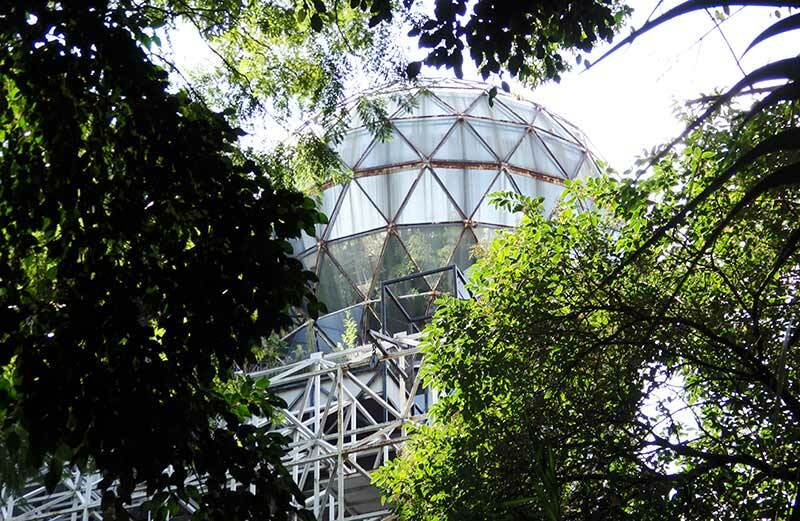 This one took me by surprise… a modern steel construction building with a geodesic dome on the roof! The Restaurant Matisse is a well-known gourmet experience on Avenida Amsterdam. By now it’s quite likely we are hungry again! Good thing there are eateries of every type everywhere we look. With no previous research, and having had my fill of Mexican food, I’m voting for that Italian place I see on the corner of Michoacán and Amsterdam—Nonna Cucina Bar. Let’s take this nice outside table. I’ve decided on the Pollo in Crosta di Limone, a smoked chicken breast with parsley sauce, topped with thinly sliced lemons and then grilled. 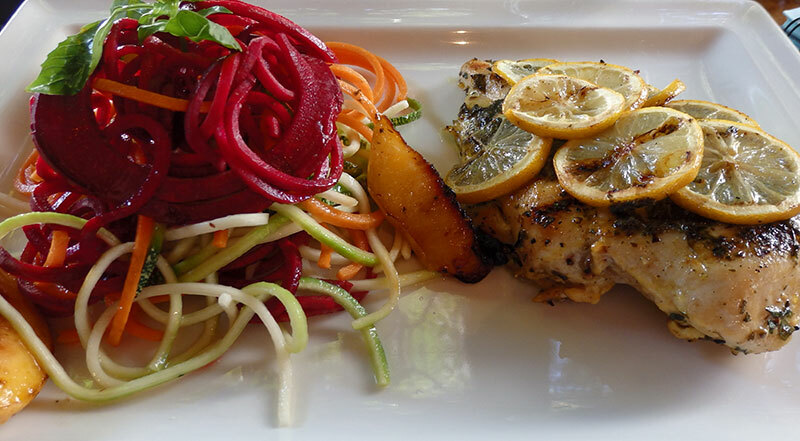 It is served with a salad of spiral cut carrots, beets and zucchini with grilled peaches and is as pretty as it is tasty. It comes with a plate of lovely warm puffed-up pita bread and olive oil with balsamic for dipping. While we are eating, an accordion player comes buy and stops to play a few songs before passing the hat among the customers. I don’t mind giving him a few pesos. I love living in a country that still has a robust job market for accordion players! Time to stroll some more and work off that meal. But soon we will want dessert. 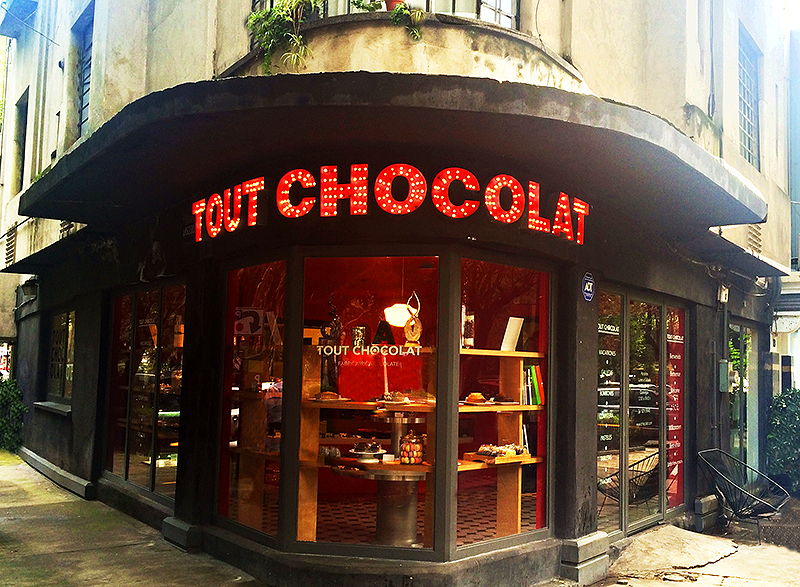 And the only possible place for that on Avenida Amsterdam, I am told, is Tout Chocolat at Amsterdam 154. It is chocolate heaven, I am told. Just go, I am told. Nothing else comes close, I am told. I always do as I am told… at least when it comes to chocolate. So off we go to the pretty and classy shop on the corner owned by Luis Robledos Richards. He trained at the prestigious French Culinary Institute’s “Classic Pastry Arts” program and the Ecóle Lenotre in Paris, and then worked as head pastry chef at both Paris’ Le Cirque and the Four Seasons Hotel in New York. He’s been named one of the Top Ten Chocolatiers in North America and has won the World Chocolate Masters competition TWICE. Yeah, the guy has the creds. And now Mexico City gets the benefit. And so do we! Open the door. Close your eyes. Inhale. Ahhh… that smell. Pure chocolate decadence. What could be better? And remember, Mexico is where chocolate was first invented! The beauty of the offerings is staggering and so are the choices. Chocolate bars, cakes, brownies. Truffles and hot chocolate and bonbons. Just a few of our flavor choices include: marshmallow or maracuya, spicy chia, white peach and apricot, hazelnut balls, lime caramel, mezcal truffles with sea salt (quite amazing and impossible to describe but YES!). Then there are pear chocolates, ginger chocolates, white chocolate, salted caramel chocolates…. Sorry, I am running out of room and drooling onto the keyboard here. But be sure I am buying some to take back with me! Our stroll is nearly done as we return to the spot on the oval of Avenida Amsterdam where we began. The din of traffic notches back up a few decibels. 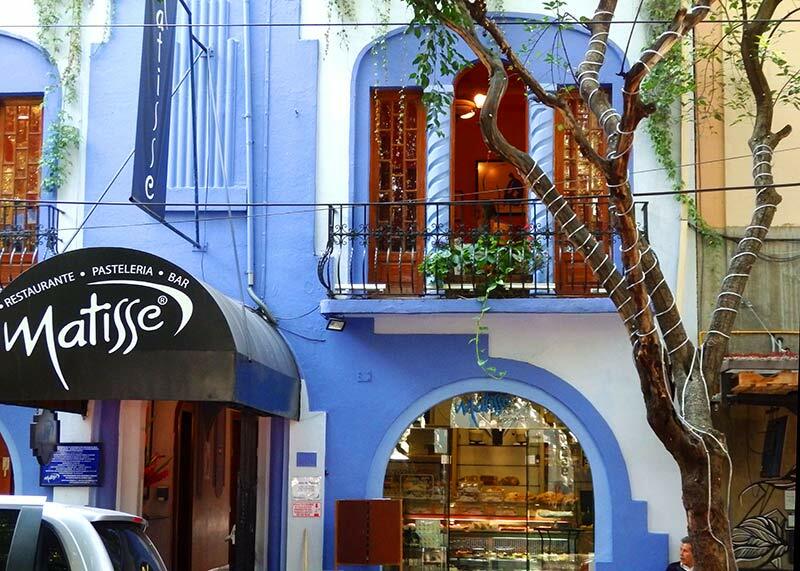 Perhaps tomorrow we’ll explore more of this hip Condesa neighborhood. Or maybe pop over to Roma or Polanco. Or head into the Centro and check out the enormous central square called the Zócalo. Or marvel at the pre-Columbian treasures in the Anthropological Museum. Flowers to take back to a hotel room or an AirBnB temporary home. Perhaps for now, we’ll just stop at that stand on the corner and pick up a bunch of bright flowers to take back to our room, a little something to bring a bit of the peace and color of Avenida Amsterdam with us. How nice to remember the pleasure of a slow stroll beneath the trees—the peace and the people, the food and the color, to take in this part of Mexico City that so many tourists never see. On my visit to Mexico City, I stayed in an accommodation I booked through AirBnB. Have you tried it yet? I love AirBnB and have used it in France, Spain, the Netherlands, Czech Republic, Mexico and the US… so far! In expensive cities, like Amsterdam and Paris, I find I often save money over the cost of a hotel, and I love the convenience of having kitchen facilities. I even host guests in my own home in Mexico through AirBnB. If you haven’t yet tried the service, consider signing up today. If you use this AirBnB link to register, you’ll get a $20 credit you can use towards your first booking. In some inexpensive locations, that’s like getting your first night free! And I will also get a credit towards my next booking, so I’ll be a happy Nomad Woman too! Don’t you love win-win? Wonderful post Donna! Can’t wait to explore Avenida Amsterdam on my next trip to Mexico City. An informative, fun and colorful article. Thank you! Thanks Jan. I think you will enjoy it. Beautiful post, Donna. I’ve not been to Mexico City in ages, and am eager to return. When I do, I’ll hope to stroll the camellón of Avenida Amsterdam, which looks splendid. And of course, all those places to stop for a bite. Thanks for the marvelous recommendations! I think you will love it, Anita. The culinary scene in Mexico City right now it truly amazing, not just in Condesa but throughout the city, including places on “Best in the World” lists. You and Tom will have a great time! Loved the pictures and the post! It’s years since I visited Mexico City. Clearly it’s time for me to go back! Thanks Ursula. Yes, you should go back. 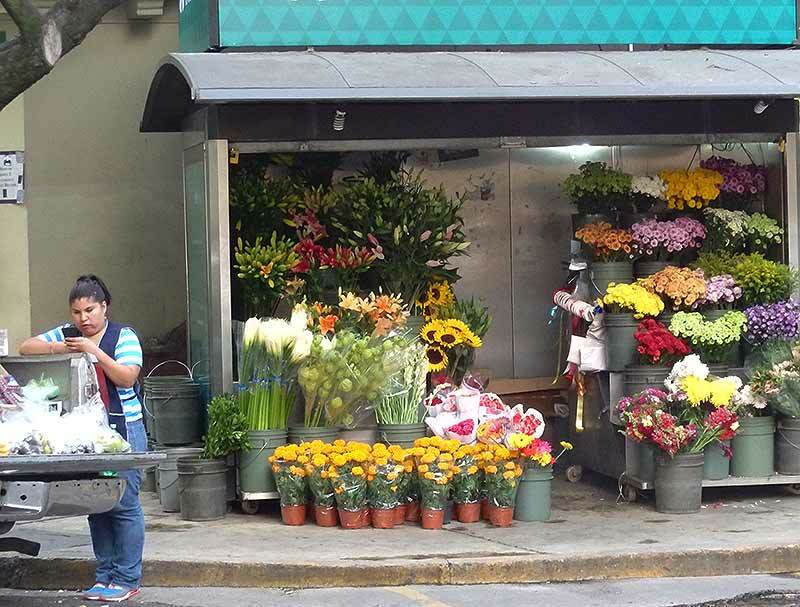 Mexico City is a vibrant, dynamic city with world-class amenities and a very up-to-date vibe. And the current culinary scene is amazing! 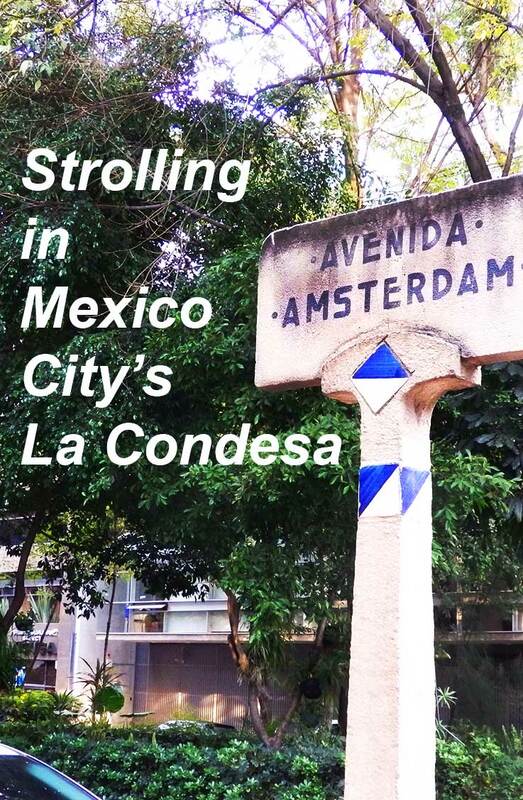 I loved walking along Avenida Amsterdam when I stayed in La Condesa last year during Thanksgiving. I recognize so many of the places you featured in your photos – loved Tout Chocolat – so delicious! 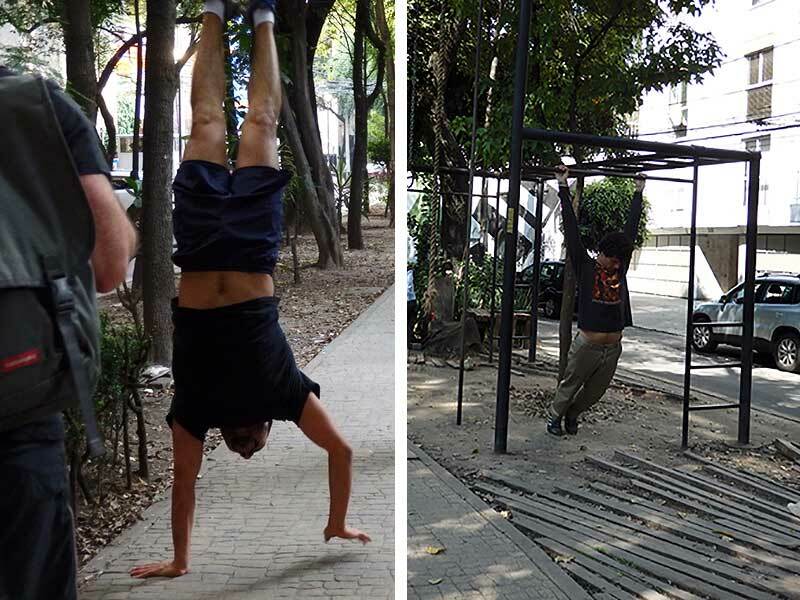 What a wonderful neighborhood – can’t wait to go back to Mexico City! Thanks Susan. Yes, clearly I loved it too. I hope to go back to the city in January or February. 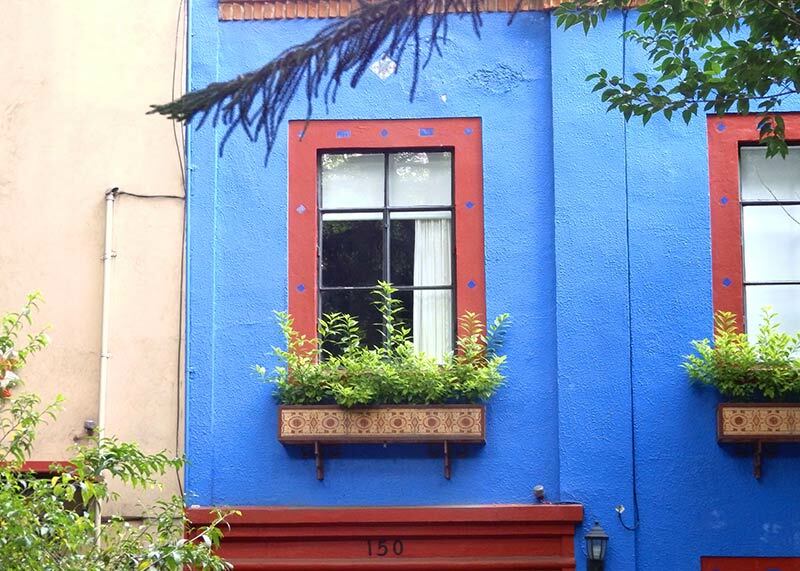 And I plan to stay in Condesa again, my new fave neighborhood! It’s been a long time since I’ve been to Mexico and never to Mexico city. I love the color and the architecture that you’ve shared here. Your dinner looks amazing, and I might never leave Tout Chocolat! 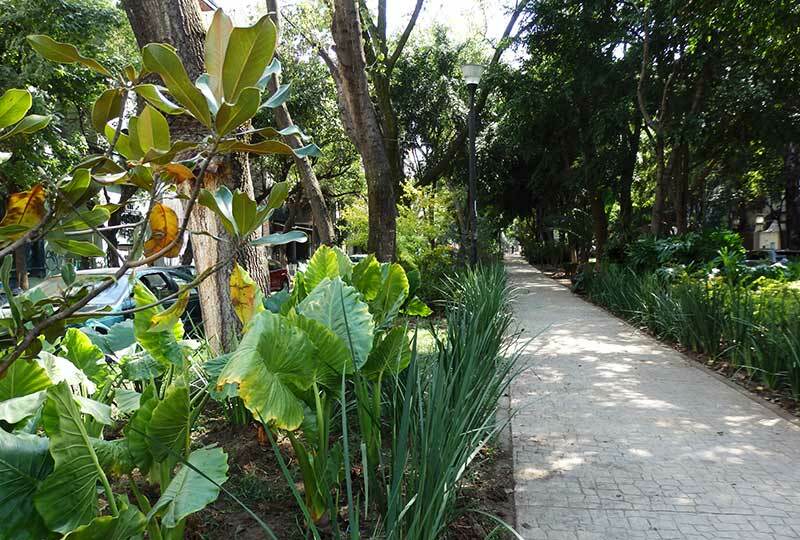 Wonderful collection of photos to go around this stroll through Avenida. I hope to visit someday and feel like I already have, thanks to your great post, Donna! Thank you for sharing. Thanks Carl. It is a beautiful spot. I have not seen it since the earthquake, and I do know that some of the worst damamge was in Condesa. I am going to visit soon and hope to see it still much the same.